Stage 17 of this year’s Tour will be remembered as one of the shortest road stages in history of the event—and one of the most brutal in this year’s race. With 3 incredibly hard climbs to tackle in only 65km of racing, the race was dominated by the team tactics of Movistar who were to the fore in the early break. Team leader Nairo Quintana ultimately rode solo over the last two climbs to take the win from the ever-aggressive Daniel Martin. This was an anticipated day for the GC riders to make a big shake up, but the dominance of Team Sky was visible as they rode much of the tempo at the front of the bunch. Chris Froome, however, began to show some cracks in the final kilometers, and Geraint Thomas extended his lead over the others in the top 5. The stage today was going to be hard from the flag drop: Any teams gunning for a stage win needed to be in that initial move. 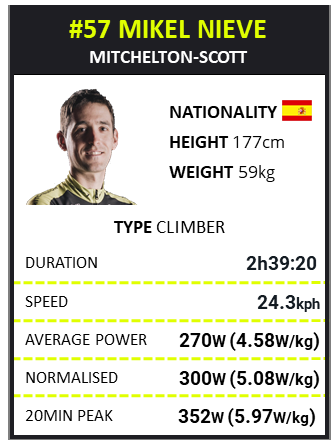 Nieve’s team, Mitchelton-Scott GreenEDGE, was definitely hoping to give Adam Yates a shot at a win after his close call the day before. And super-domestique Mikel Nieve would have been the designated engine. The opening 500m of the stage saw Mikel explode into his peak 1min power for the day to get to the front of the peloton and into the lead. In the opening 1.3km he did 375w, 6.41w/kg to get himself into position and onto the front of the peloton. Unfortunately for Mikel, a group had already gone up the road, led by Astana’s Tanel Kangert and Cofidis’ Nicolas Edet. This left Mikel in a position to make a big effort along with the large group of 20 others to keep the leaders close enough to bridge later. 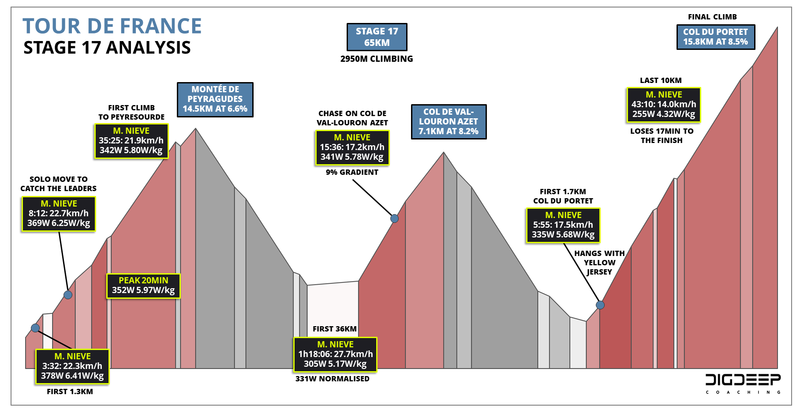 This initial big push on the Col de Peyresourde was very intense, with Mikel riding at 369w, 6.25w/kg for 8:12min. As we’ve seen is the pattern on mountain stages, it was during this opening climb that Mikel set his peak 20min power for the day, of 352w, 5.97w/kg; a very unpleasant opening to the stage. The pace set on the Peyresourde took a clear toll on the riders as they hit the Col de Val Louron. 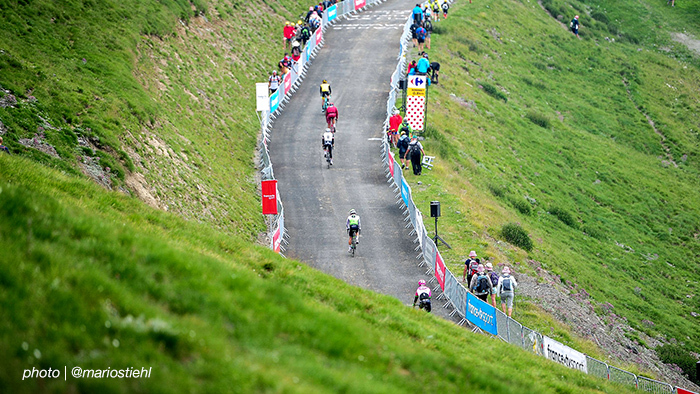 On this climb the chasing break of the original 22 was splintered in two, with Mikel in the second group after doing enough to keep his team leader Adam Yates in the leading group. With the peloton still being led by Team Sky the effort required to keep in touch with the second chase group on the road was high—Mikel had to keep a tempo almost identical to that of the Peyresourde. On this climb he again rode at 5.75w/kg, which seems to be the effort he knew he could sustain for a long duration without going too deep into the red. In the final 1.2 kilometers of this climb, Mikel’s effort went up a notch as he was swallowed up by the remainder of the peloton, which at this point was down to just 22 riders. Here he jumped to an effort of 6.05w/kg, 357w for 3 ½ min. From this small snap shot of the effort required to be within the GC group we can estimate that they probably rode much of the climb around 5.9-6.1w/kg. In the 1hr 18min it took Mikel to cover the first two climbs of the day he had to average 305w, 5.17w/kg, with a normalized power of 331w, 5.61w/kg. This is fantastic data to understand the intensity in this short stage. As the main GC group hit the lower slopes of the final climb up to the Col du Portet, team Movistar took control of the tempo to help launch an attack by Nairo. As he fought to keep pace with the leaders, Mikel had to do 335w, 5.68w/kg for nearly 6min. Unfortunately, the pace was too high, and those early efforts started to take a toll as Mikel lost contact with this group with 13.5km to go to the finish. At this point it was all about getting to the top of the mountain and keep some gas in the tank for the last day in the Pyrenees on Friday. For the remainder of this long climb, Mikel rode at a relatively steady tempo of around 255w, 4.32w/kg. It took 43min for him to get to the top after he let go of the Yellow jersey group. This was a brutal climb for the riders today, as they not only had to fight against the length of the climb and the steep gradients but also the high altitude; the summit was at 2200 meters. The climb also proved a pivotal point in this year’s Tour, with Geraint Thomas affirming his power and strength by significantly extending his lead. This type of short, intense stage will perhaps be something seen more in the future as cycling looks to evolve and try new formats.